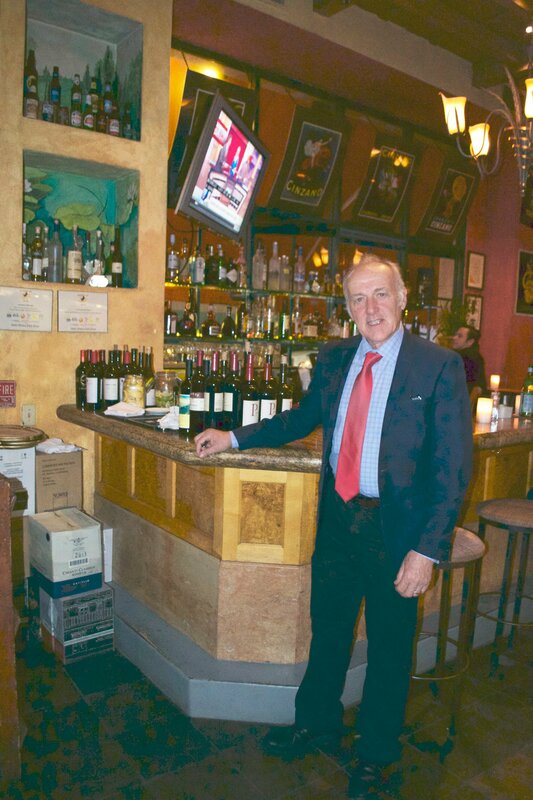 After dining at many of the premier restaurants in the Los Angels area, Hollywood Press Corps had the pleasure of experiencing Locanda Del Lago in the 3rd Street Promenade of Santa Monica and it is among the best of the best. Specializing in dishes from the northern region of Italy, Michelin star rated chef, Gianfranco Minuz has definitely perfected his farm to table menu and sommelier, Joseph Matlock, knows exactly how to pair wines with each course. The restaurant is tastefully decorated in Italian decor with warm lighting, rich colors, gorgeous chandeliers and beautiful wood tables. Located conveniently on the 3rd Street Promenade, steps away from the Santa Monica Pier, this wonderful restaurant attracts tourists and locals alike. We decided to keep it simple so we chose the Celebration of Winter tasting menu. Each item has been created with the freshest organic produce obtained from the Santa Monica Farmers’ Market and sustainable proteins, and always follow the suggestions of the Seafood Watch by Monterey Bay Aquarium. Prior to our first course, we were brought a treat of parmesan lace and refreshing cocktails prepared personally by mixmaster Joseph Matlock. The thin, crunchy cheese strips are a welcome alternative to the traditional bread sticks and slices that most restaurants provide and paired perfectly with a delicious raspberry lemon drop martini. This was such an incredible start, I would come back just for this pairing! The most amazing salad was our first course. 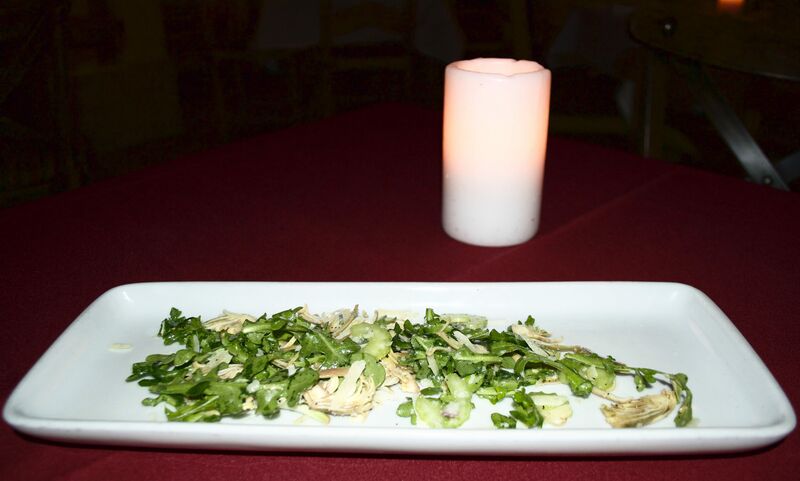 Insalata dI Carciofi al parmigiano or Raw Market Baby Artichoke Salad, was hand crafted using baby artichokes, celery, arugula, parmesan cheese, and was seasoned with a delicious lemon dressing The wine pairing was the perfect choice of sparkling wine from Italy, Prosecco, Valdo. A perfect start to a grand meal. RIsotto con Cime dI piselli E Cappesante was delivered as our next course. It was made with Carnaroli Risotto, Market Pea Shoot, Peruvian Bay Scallop, and ParmesanCheese. A Pinot Grigio, Borgo Conventi, ’14 was chosen as the pairing and it was quite a treat. Of all of the risottos that The Hollywood Press Corps has had the pleasure of tasting, Locanda Del Lago has proven to be one of the top creators of this crowd-pleasing dish. Perfectly seasoned, delightfully creamy, and precisely rich, I would recommend this item to the pickiest of diners. For our first main course, we chose the pesce spada alla grIglia, cavolflori e salmorIglio, which was a perfectly Grilled Pacific Swordfish, Sautéed Market Cauliflower with Paprika in a Sicilian Salmoriglio Sauce. It was paired with a Chardonnay, Chateau St. Jean, ’12. The wine was buttery and smooth and enhanced the healthy, fresh flavors of the fish and vegetables. A great choice for those of us who are health conscious but still want grand flavors. 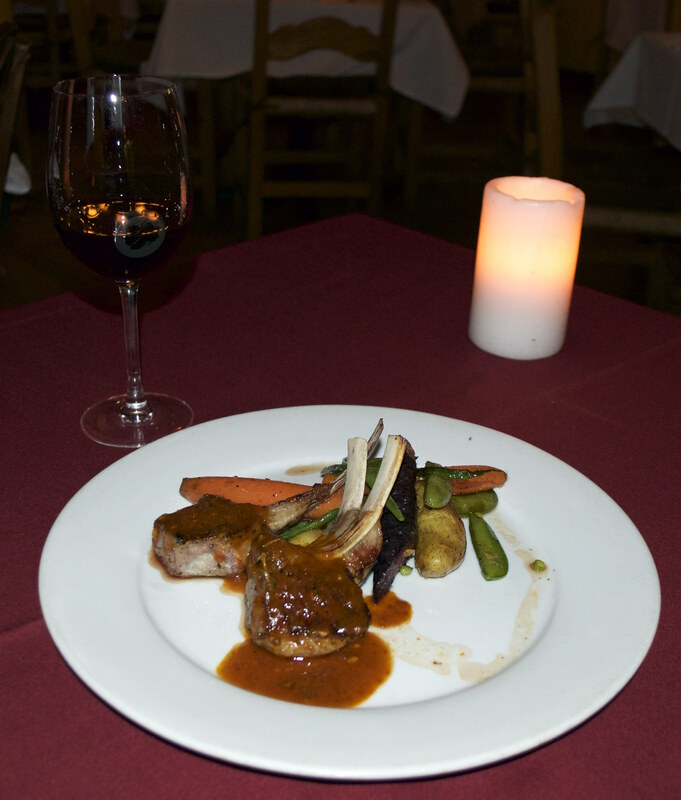 Our second main course was Costolette dI Agnello Arrostite, Primizie del Mercato dI Stagione, which is a roasted, all natural Niman Ranch Lamb Rack Chop with Farmers’ Market seasonal baby veggie mix, in a tomato-thyme Sauce. Deeply Italian in flavors and aromas, this dish paired ideally with a chewy Cabernet Sauvignon, Buehler, ’13. This was a satisfyingly delectable meal. And the grand finale was a winter dessert specialty that tasted so much like an Italian decadent delight. 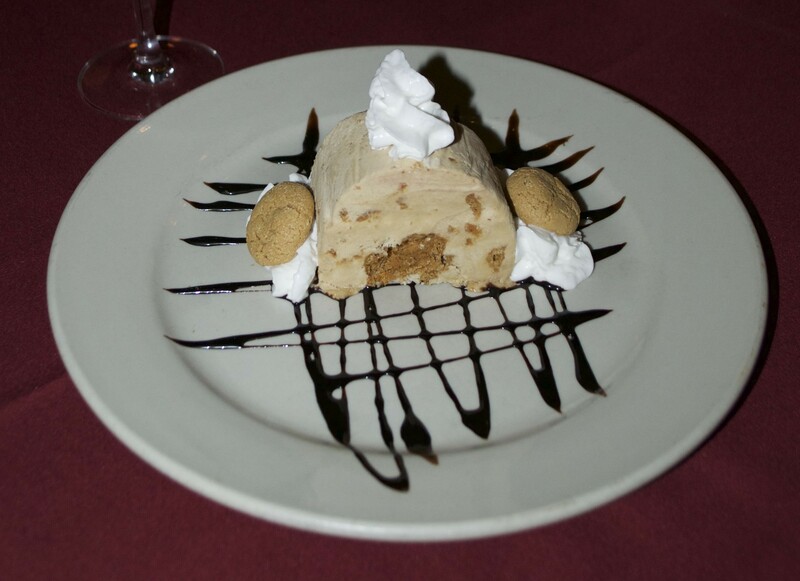 Semifreddo Al Caffe’ E Amaretti is an Italian frozen coffee meringue with Amaretti cookies and was paired with a Moscato d’Asti, Michele Chiarlo. A fabulous departure from teramisu, this dessert did not disappoint. It capped off the perfect meal and was light and spectacular. The Hollywood Press Corps was thankful to have been invited to this incredible restaurant. It truly was one of the most delicious evenings we have experienced to date. A definite “must-try” dining establishment for anyone traveling to or even through the Santa Monica area. You will be pleasantly rewarded with amazing flavors, incredible service, and a romantic, slightly rustic, environment.